Custom Rod Wars - Are They Worth It? The custom rod scene is blowing up in a big way. Granted, it has always been full of great rod makers, but now it seems to be exploding into the mainstream...or at least onto my Facebook homepage. I think a large part of that is due to the fact that many small business builders are linking up with the kayak fishing scene. They are smart. Kayak fishing is booming and is shaping up to only get bigger. With growth comes spending. And my Facebook homepage is already slammed full of frivolous spending and subsequent bragging. Look at my new 9+ inch fish finder that I can barely use! A lot of it has been fueled by the Manley Rods new, ingenius, marketing promo to join their team. But like any purchase, try before you buy. You hear folks constantly harp on that point when buying a kayak or paddle. Why would it not be the case of a rod. There are tons of great rods out there - custom or otherwise. But I'll vouche for custom rods. I've been using custom rods for about 3 years now. But I certainly wouldn't pick up just any custom rod and promote it with a silly grin on my face. I found what worked for me. Here are my thoughts. At first I was pessimistic. I really wasn't sure if that custom rod price tag was truly worth it. So I made it a point to pick-up as many rods as possible - noting their action, flex, dimensions, guides, etc. I found some great rods with bang for the buck. I found some amazing rods that were way outside of my price range (I'm looking at you G-Loomis). And in the end, I found that you get what you pay for. That thought was consistently backed-up by tournament anglers, reps, and pros that I talked with. One guy, a former BASS Elite qualifier, proclaimed, "why would you not get a custom rod? If it weren't for endorsements, every tour pro would have a deck covered with them. What you don't see is what they fish with on their off-days." That pretty much sealed the deal for me. While acting as president for the Duke Fishing Team, I happened to meet a local rod maker just down the road from where I was living. At the time, he was building rods in his home on the edge of Chapel Hill. Anyone who knows me knows that it takes all my energy and patience to tolerate Chapel Hill, NC. But I was beyond excited to make my first trip to see his set-up and pick his brain. Over the course of an hour or two, I saw some things I liked, as well as some I didn't, but the potential was limitless. He let me demo rods and walked me through books, showing me exactly what I could order. He weighed out rods down to the ounce. He showed me how intricate wrapping can turn a fishing rod into a thing of beauty. A couple weeks later, I placed my first order. Then another and another and another. Eventually, my relationship with Carolina Custom Rods really took off. Now, I own a stable of CCR custom rods that I absolutely love, each made exactly the way I want. I want to address a few things I hear all that time. The first is, "this is the perfect rod for kayak fishermen." What does that even mean? Why would a kayak fisherman be different than a power boat fisherman? The only arguments I can see are 1) higher likeliness that a rod ends up in the water , 2) less room to store/manage rods and 3) the notion that kayak fisherman can't afford power boats, so why could we afford expensive gear. I'll start with number 3. 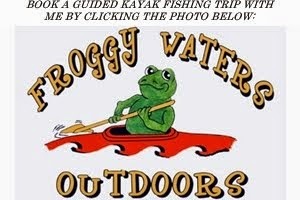 While agree that kayak fishermen can be cheap, so are pretty much all fishermen. And again, I constantly see guys dropping ridiculous amounts of money on their kayaks and gear. All that being said, it is all about bang for the buck. Number 2 is a valid point. I usually ride with 4 rods - sometimes 5. But I regularly see guys hauling 7-8 rods. Heck, most guys like to brag about how many they take. In fact, I don't know any angler (serious or otherwise) who only uses 1 fishing rod. So I don't necessarily buy the point number 2. Number 1, now that is a great point. A floating rod would be awesome. But floating rods should not sacrifice quality (see the now defunct Overboard Rods). So, what does it all boil down to? It is different for each individual angler. But I put in the research before choosing. On this particular day last spring, fish were crushing blade baits. But before switching to a rod with the right action, it led to many missed fished and a couple lost giants. I currently own about a dozen conventional rods. Each has a specific purpose. I have a cranking rod, deep cranker, finesse rod, jig and worm rod, jerkbait-topwater rod, all purpose rod, etc. All of those rods were made exactly the way I wanted them - some fairly plain and some very customized. I would say that for me, undoubtedly, the most important features were action, flex, and weight of the rod. Spend a day working a jerkbait or topwater walking bait using a rod with the wrong action and length and you end up booking a consult for carpal tunnel a few days later. There all some great all-purpose rods out there and I even own a couple, but there is no rod to rule them all and all too often, I find myself yearning for that technique specific rod. I will note that all of my casting rods float and the key is weight. Not only is weight important to maintain bouyancy, it is crucial for sensitivity and comfort. For a long time, I used the Abu Garcia Vendetta 7', medium heavy casting rod. It was a great all-around rod for the price. But it was heavy and clumsy. I also used the Abu Garcia Veritas 7', medium heavy casting rod - widely considered one of the best all-around, bang for the buck rods available. But after picking up a custom rod, of which most of mine check in under 4-ounces, the difference is unreal. You feel everything. I can immediately tell you bottom composition and detect every little bit of structure. In fact, it has elimnated my need for a fishfinder on about 90% of my trips. Now that is bang for the buck. Since it is the day before Thanksgiving, I must tip my hat and give a huge thanks to Brett Hinson, owner of Carolina Custom Rods. His rods forever changed the way I fish and perceive value. I urge you to give custom rods a try. You now know where my allegiances lie and I strongly urge anyone interested in a custom rod to contact Brett. His work is incredible. But at the very least, try before you buy, do some research, and don't just jump at the first link that shows up on your Facebook feed. Until next time, tight lines.